More International Releases are found in Mac OS Anthology '99 Disc 4 German CD Scan MacOS85_DE.ZIP Mac OS 8.5 Install CD-ROM image (German). 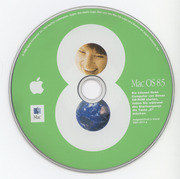 MacOS85_ES.ZIP Mac OS 8.5 Install CD-ROM image (Spanish). MacOS85_IT.ZIP Mac OS 8.5 Install CD-ROM image (Italian). 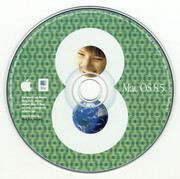 This is the Mac OS 8.5 CD-ROM special edition provided by Apple IS&T for internal use only. It includes the base Mac OS 8.5 installer with the guided way to install (such as unlocking disks, check drive using Norton Disk Doctor, etc.) as well some extra goodies that were exclusively available internally for Apple employers such as Apple software like AppleWorks 5.0.3 and HyperCard 2.4.1, several site licensed software such as Acrobat Reader 3.0, Microsoft Office 98, FileMaker Pro 4.1, and Norton Utilities 4.0, and other nice software. MacOS85_Internal.ZIP: Mac OS 8.5 Internal Edition CD-ROM image. Several features do not work in SheepShaver but do in Mac OS 9 such as Mac OS Help. For PowerMac G3 install, while the installer uses the special code to detect the Power Mac G3 to install, it's possible to install this software in other computers . I have a blueberry. I do want 8.6 for better After Dark support (as I understand it, 9 wasn't really much better but it dropped compatibility for lots of older things including most After Dark modules). Is there an 8.6 CD on this site that would work with it? I would just install 9.0.4, unless there some big reason you want 8.6. I have a 350 MHz slot loading one. Will any of these discs work with it? The earliest version of Mac OS my iMac can run is 8.6 though. Can someone else verify that they can boot from that image (maybe write it using a classic mac and see if that fixes it)? Perhaps the image u downloaded is not bootable. Instead of, u can DL Mac OS 8.5 on that link above, but of course, u need to update manually to 8.6, then... The archive there is a bin/cue image, so, I don't really think it could be a problem with ImgBurn & Windows. Thanks for the fast reply. I was able to use imgburn to burn the disc but it wasn't bootable. I've gone through 3 different discs using different programs trying to make it bootable. Is there a way to do this from Windows, or should I just buy a copy of the CD? You can use ImgBurn to do the task. Just rename the ".toast" images to ".iso" before burning them (don't open or mount them before this). How can I write a bootable copy using Windows? I don't have an old mac with a CD burner. or there is another install/restore for the sawtooth of 9.02 - which i ordered from ebay - and am providing for you now! does anyone know what the 8.6 version for the AGP sawtooth looked like? was it visually identical to this 8.6 version for the YIKES? telling me my computer is not supported by this program. I was looking for the Mac G3 Blue and White Image, if you could provide one I would really appreciate it. So, do you have an image of the "B&W G3 CD-ROM" listed above? I have that disc if you need it. I have an image of the G4-version of Mac OS 8.6 (German). If anyone wants to mirror it, I can give it to him. I will say one more time, PLEASE USE EARLIER VERSION OF STUFFIT! Fails upon attempting to install: "Problems attempting to read the source file "Big System Morsels". Installation cannot continue."